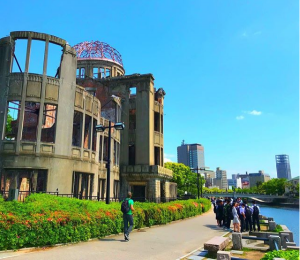 The Atomic Bomb Dome is the most famous A-bombed building in Hiroshima, and it is a World Heritage site. Before the atomic bomb was dropped, this building was the Hiroshima Prefectural Industrial Hall, and was very popular with the people of Hiroshima. As a result of overwhelming demand to save this building, the Atomic Bomb Dome remains standing as it was on August 6th, 1945.